Condition is Used. This heats up after a while but I did research and I guess they all do. Theres a remote that doesn't work I don't even know if the remote goes with it actually. (See Pictures). It was tested and it is in good working order. Picture is clear and free of spots and lines. All buttons works and are fully functional. Lamp has hours used. No other accessories included. Optoma GT1080 DLP Projector. Condition is Used. Shipped with USPS Priority Mail. The bulb has been replaced and has about 7 months of use. The fan has also gotten a bit louder than when I got it but everything works I have been using it as my xbox one gaming setup, and decided to get a more high dollar projector recently. This comes with the carrying bag, plug, and remote. Power cord (has exposed lines) is included! Used & in good working condition! Bulb has 983 hours. ERB15,604-NWS. We are closed on weekends. Good used working order! Neat little projector. Trending at $274.99eBay determines this price through a machine learned model of the product's sale prices within the last 90 days. It's in excellent condition with only light marks from installation and cleaning. Like new Optima projector. Only used for one event. Lamp has less than 30 hours on it (see picture). Image looks great, the picture of the projection came out weird due to my phone’s camera, but it looks fine in real life. Includes long hdmi cable, remote, power cord, vga cable, a nice bag, some literature, and original box. I turned it on but didn’t hook anything up or test every feature so it is sold as-is. Ootoma Uhd51a. Condition is New and factory sealed. Does have sticker residue on box. You can protect unofficial use of the Optoma EP716 projector by setting a password. Ceiling Bracket. This projector is in perfect condition! Includes original case, remote, power cord and HD adapter. Up for sale is an Optoma EP739 (EzPro 739) DLP projector. It has been tested and works. I tested the projector with a Roku device set at 720p. The projector displays a resolution of 1024x768 (XGA) but can accept inputs as high as 1400x1050 (will compress). 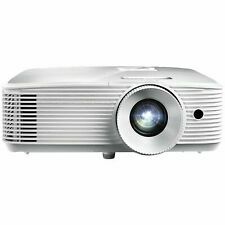 New ListingOptoma HD27HDR 3400 Lumens 1080p Home Theater Projector New 0 Hours , MINT ! I have here for sale a Optoma GT1080. This has been used for a total of 250 hours the lamp security sticker is intact.This produces a beautiful image and is very bright even in eco mode.This sale includes the projector, remote and the power cord, quick user guide and disk, USB-c to HDMI cable. Projector Optoma DLP Texas Instruments Pre Owned. Photo is of actual item. All offers will be considered. No remote and this projector does not have built in speakers. It works, but makes some noise like most projectors. Sold as is. 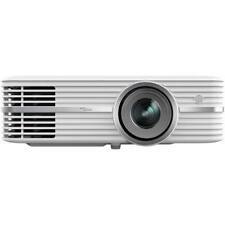 Projector Specification: Type: DLP. Tested and working. Factory reset but lamp only has 355 Hours. Lamp hours : 355. Test result: Bright under normal lighting. Great for text, movies, etc. Mounting: Ceiling ,Table, Rear, Front. I bought this to do a review - it's a great little projector that's well built and has great image quality. RECERTIFIED OPTOMA ZW300UST PROJECTOR. Mfr Part #: ZW300USTRFBA. Check-Out Now! Optima 3000LM 1080P GAME PROJECTOR. Condition is New. Shipped with USPS Priority Mail. Optoma PT100 DLP Projector. New condition. OPTOMA EP761 DLP PROJECTOR. VERY GOOD CONDITION. LAMP HOURS USED 1645. Projector Size:3.7" x 11.5" x 8.7". "diagonal screen, place the projector lens between 13'-0" and 14'-4" from the screen. Zoom Lens:1.10:1Std. Optoma EP719 Portable Projector with All cables and Connectors. Standard Zoom Lens: 1.10:1. Digital Zoom: . Speakers: 2.0 W Mono. Eco-Mode: 28.0 dB. Audible Noise: . Throw Ratio(D:W): 1.93:1 - 2.13:1. HDR10 compatibility with DCI-P3 wide color gamut and 1,000,000:1 contrast ratio produce incredible cinematic colors with deeper blacks and brighter whites. HDMI 2.0 with HDCP 2.2 ensures compatibility with the latest 4K UHD devices for stunning image quality. Optoma UHZ65 4K UHD LASER HDR Home Theater Projector - One only! HDMI 2.0 and HDCP 2.2 ensure compatibility with 4K UHD video sources. Powerful Laser 4K Ultra High-Definition Projector. The laser-phosphor light source provides a remarkable 20,000 hours of life for reliability with minimal maintenance. Trending at $3,399.00eBay determines this price through a machine learned model of the product's sale prices within the last 90 days. Optoma DLP Projector EH500 & SAVI 2-Way 100W Speaker Set. Projector and. This is a Opened Box Deal, Nothing has been used! This set is a. 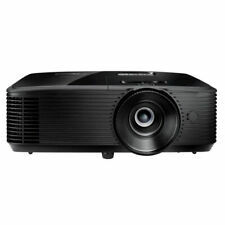 New ListingOPTOMA HD8000 FULL HD 1080p DLP PROJECTOR! Optoma GT1080Darbee DLP Projection Display. Back wall shelve Left C or D. A result from this could be fingerprints, dust or light dirt, or even light marks. Unless item is specified to have an original factory seal. Used like new , product has only been used a few times, played Xbox and Playstation games on it, completely enjoyed this compact projector. Absolutely great product for the price. Factory Sealed. HDMI 2.0 and HDCP 2.2 technologies ensure compatibility with 4K UHD video sources for amazing details, clarity and vibrant colors. 4K UHD HDR gaming ready with the latest consoles and gaming PCs. Trending at $1,248.23eBay determines this price through a machine learned model of the product's sale prices within the last 90 days. Throw Ratio. 1.07 Billion. Throw Distance. Lamp show 28 hours. D-Sub, HDMI, Composite, S-Video. Front, rear, ceiling mount, table top. Used good working. Cabinet Color.